I recently returned from New York City where I spent a lot of time immersed in tarot-related workshops, study groups, meditations, interactions, and transactions. It was glorious! Our hosts were Ruth Ann and Wald Amberstone, founders of the Tarot School and of the Readers Studio, possibly the largest tarot conference in existence at this time. You’ll get to read about it here in four blog posts in order to savour the experience bit by bit. Today’s piece will cover my Wednesday and Thursday experiences (April 22 and 23). On Wednesday, 22 April, I flew to LaGuardia Airport then got settled into my hotel room. When I went to the bar for a snack and a drink, the bartender’s warm greeting of remembrance immediately made me feel at home. Many of us in the tarot tribe gathered in the lobby and took a bus to Manhattan. We were dropped off at Rockefeller Plaza, so I naturally wanted to poke around the gift shop of the Metropolitan Museum of Art. I bought a lovely bookmark of one of the famous unicorn tapestries — mythic symbols were already working me. At 7:00 p.m., I met innovative tarologist Enrique Enriquez for dinner at Buvette, a fabulous French restaurant in the West Village. Enrique’s passion for the Tarot de Marseille and his refreshing non-esoteric approach to reading Marseille-style decks make him a fascinating voice and presence in cartomantic spheres. Over excellent food and beverage, we held a natural and meaningful conversation about life changes that have occurred since our last meeting, what’s new in our tarot work, our ideal clients, our preferred types of tarot experiences, food, and daily living. This congenial interaction spilled over into our stroll through Greenwich Village and Chelsea, admiring architecture and the general atmosphere of where we were. A true NYC experience. Thursday, 23 April was our one-day Tarot and Psychology Conference, the third such event offered by the Tarot School. The three presenters were Dr. Art Rosengarten, Rick Bouchard, and Andy Matzner. Each session was rich with ideas and useful tips, so I’ll limit myself to personal highlights. The randomness factor can surprise the readee/client into insight. Tarot images can evoke the perspicacity of the inner teacher. The first two points can remind the readee/client of hir innate wholeness, creativity, wisdom, and resourcefulness. Art encouraged us to stay with the practice of “first thought, best thought.” In other words, notice the first thought about a card that “clicks”, deliver it without over-explaining, then step back and allow the client to take it in. As a creator of tarot circle encounters, I enjoyed receiving instructions for the Three Windows Game that Art devised to play in small groups of four to six people. Individuation is the process of a person becoming hirself, whole and distinct from others. Active imagination is a meditative technique that serves as a bridge between the conscious ego and the unconscious. The four stages of Jungian analysis are confession, education, elucidation, and transformation. Each of these can be used as the basis for a tarot encounter and/or a reading can be done for each stage as therapy progresses. I enjoyed spending time on using the tarot in conjunction with dreams. Rick, like me, prefers dream exploration or amplification rather than “interpretation.” He took us through the five-part dramatic structure of a dream: exposition, rising action, climax, falling action, and lysis. 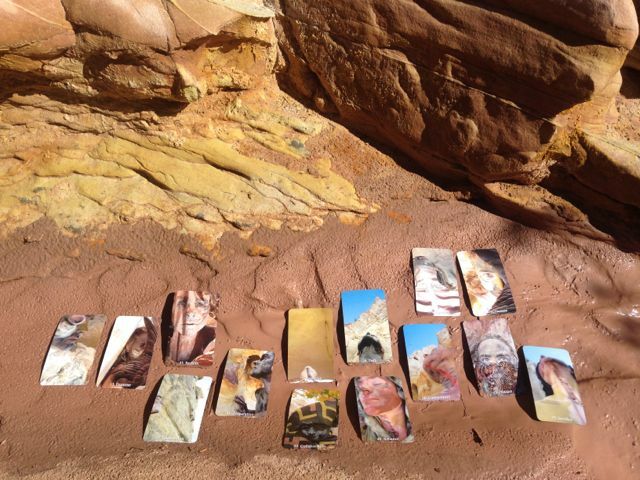 We then had an opportunity to share a dream with a partner, select one tarot card from our face-up pack for each part of our dream, to do a reading in order to discover another layer of story that the dream might suggest through the symbolism of the cards. Kelli, the woman with whom I was doing this activity, helped me crack open my dream when she said seven words (I wrote them down) about the central card in the layout. It was a wonderful “aha” moment for me. Rick also told us about a 22-card projective experience that we can do with people, much like word association except with tarot pictures, that can help identify one’s complexes (sets of unprocessed emotional themes). My values. What’s important to me. What makes life worth living? The secret message of each card we chose. How am I living these values in my everyday life? What can I do right now so that at the moment of death I won’t have any regrets? What am I afraid of? What will allow me to successfully overcome that fear? What would my life be like without that fear? Which single card will give me the strength and inspiration to live my life without regret? Why? How can I creatively express and enact this card? To conclude, I selected the Knight of Coins from the Fountain Tarot, a new deck on the market, to remind me to cherish a sense of ease and “at-home-ness” in myself and on the Earth. My creative honouring of this card includes a doorway/threshold ritual, dressing in green clothing, growing a small garden, going to a sacred site, a “be a tree” meditation/ritual, and doing a contemplative scan of my body more regularly. After the evening cocktail reception (yummy fare provided by our hotel! ), I attended a night-time study group offered by Mellissae Lucia, a friend of mine who created the luscious Oracle of Initiation. Mellissae’s offering was called Ancient Initiatory Impulses. After giving us a brief background to her own initiatory experience that led to the creation of her cards, she took us through a 13-card layout that acted as a map for one’s personal quest. Most of the cards we used were from her pack, but an element of play was brought in with a sprinkling of animal cards, children’s storytelling cards, and some psychological terminology flashcards. I was struck by how often similar symbols and themes kept arising for people in the group. Something within us was definitely weaving the bits and pieces together. This study group was a simply and effective ceremony of soul awakening and gaining insight into the people into whom we can mature. This was only the first part of my recent time away! The next installment of Tarot and More in NYC, 2015 will appear here in a couple of days. Please feel free to comment on this first one, then come back to read the forthcoming posts. 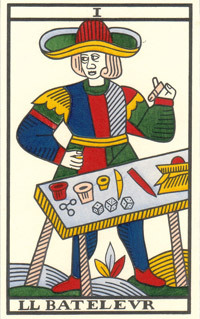 Trump I, Le Bateleur, from the Jean Noblet Tarot de Marseille, restored by Jean-Claude Flornoy. 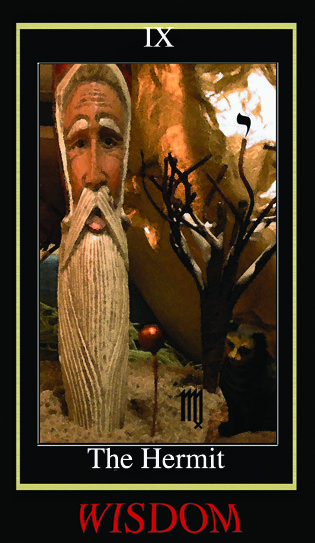 Trump IX, The Hermit, from the Tarot of the Nine Paths by Art Rosengarten. An array of cards from the Oracle of Initiation by Mellissae Lucia.